At Edgar Snyder & Associates, we see first-hand the devastation that underage drinking can cause. We represent victims of serious injuries or worse. That’s why our law firm teamed up with Children’s Hospital of Pittsburgh of UPMC to present Road Radio USA for six years. 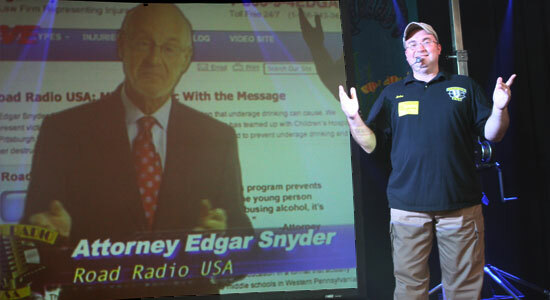 During Edgar Snyder & Associates' sponsorship of the show, Road Radio visited 164 venues, including 160 schools -- reaching 66,825 students. The following quotes come from people who experienced the impact of Road Radio USA firsthand. "You had the coolest assembly I have ever been to. It was really fun with lots of good music and it also got the message through that alcohol is bad. No matter where you go, people will love Road Radio." "I have never seen our students more engaged, motivated, and captured by a presentation as they were during Road Radio USA." "When you actually hear a true story and meet someone who almost died because of a stupid decision, it really opens your eyes. Road Radio USA taught us a lot, and we had fun learning at the same time." "Jim and Andy did a terrific job capturing our students' attention and getting their message out about the dangers of alcohol... Jim's story is truly remarkable and certainly one that every teen needs to hear." Alright, alright, alright. Listen up. All this is Road Radio USA. Now listen, Road Radio, the station that broadcasts messages, but today you guys are gonna hear that same old message like you've never heard it before. Road Radio USA is a multimedia assembly for middle school and high school students that promotes safe choices and discourages underage drinking and drunk driving. Using music, lights, video, and a simulated live radio show Road Radio USA mixes music with the message. Jimbo Stereo and Big Andy are the hosts for this experience that students won't soon forget. Throughout the show Jimbo interacts via webcam with students, community leaders, parents, school administrators, and a news reporter who talk about the consequences of drinking alcohol. If Road Radio can stop even one person from making a bad choice it's all worth it. The students are encouraged to clap, dance, and have fun while the anti drinking message is woven into the show. Then the students are riveted by a tragic true story of someone who almost died in a drunk driving accident and they get to meet him. The boisterous crowd turns silent as they hear the details. And just when you think it's over there's an uplifting ending with song, dance, and audience interaction the students love it when their teachers and school administrators get into the fun. Road Radio USA is sponsored free of charge to western Pennsylvania middle schools and high schools by Children's Hospital of Pittsburgh and Edgar Snyder & Associates; a law firm that helps victims who are injured or killed by drunk drivers. If you would like to schedule an assembly for your school call us at 1-800-9-4EDGAR.